An obvious hole in a stratus deck due to cloud seeding with aircraft, using dry ice as a seeding agent. This is an example of cold cloud seeding, where supercooled cloud droplets are converted into ice crystals, which then precipitate out of the cloud deck. 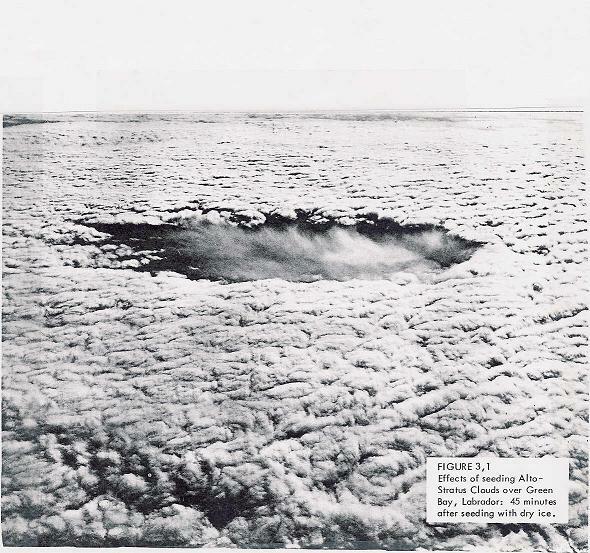 (USAF photo; boxed caption in the lower right reads "Effects of seeding Altostratus Clouds over Green Bay, Labrador: 45 minutes after seeding with dry ice". Photo and boxed caption obtained from Sewell, W.R.D., et. al., 1973: Modifying the Weather; Western Geographical Series, Vol. 9, University of Victoria, Victoria, British Columbia, Canada).